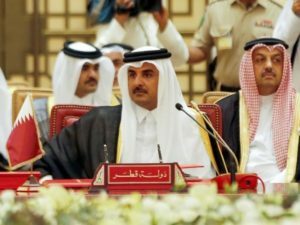 Doha announced Wednesday it received an invitation to attend this month Arab League Summit to take place in Riyadh, for the first time since the tiny gas-rich Gulf country has been sidelined by its Gulf neighbors, namely Saudi Arabia, United Arab Emirates (UAE), Bahrain plus Egypt, 10 months ago. The Qatari foreign ministry said it received the invitation to attend the event but has not made up its decision yet, London-based The New Arab reports. “The state of Qatar has received the invitation to participate in the Arab Summit, and will participate, but we have not yet decided the level of participation,” the ministry spokeswoman, Lulwa al-Khater said. The summit will kick off on April 15. Qatar took part in the preparatory process of the gathering, in Egypt, the seat of the Arab League. Saudi Arabia is hosting the event which was to take place late last month before being postponed to mid-April due to Egypt’s presidential polls. The host of the summit per regulations of the organization extends invitations to member-states. Saudi Crown Prince Mohamed bin Salam said during his recent visit to Egypt that Riyadh will not jeopardize Qatar’s attendance. The regional power and its followers; UAE, Bahrain and Egypt in June severed ties with Qatar over its support for terrorism and cozy relationship with Iran; the Arab League’s arch enemy. The four cut off air, sea and land links with Qatar. Bahrain suggested the organization freezes Qatar’s membership in the Arab League. The invitation is seen as a sign of detente after US President reportedly urged the Saudi-led camp to defuse the crisis before he hosts the leaders of the Gulf Cooperation Council at his private residence of Camp David after the holy month of Ramadan.